Mercedes' green drive and SLR | What Car? 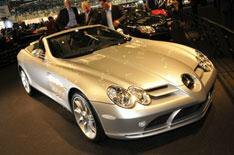 There are Mercedes scattered between the firm's own stand and the supercar pavilion, and none is faster than the Mercedes-Benz SLR McLaren, which famously took its place in history when it recorded a speed of 175.7mph on the runway of London City Airport back in July 2006. At the other extreme, the manufacturer has three Smart Eds dotted around the halls. The zero-emission electric vehicles aren't on sale yet, but are currently on test with leasing customers around the UK as part of a series of trials. Powered solely by electricity, and chargeable from any three-pin socket, the Smart Ed can achieve the equivalent of 300mpg - that amounts to a saving of up to 80% in fuel costs over the Smart Fortwo. It can travel up to 72 miles between charges, which typically take around eight hours for a full charge. There's also a CLS 350 Blue Efficiency, which goes on sale this autumn and showcases some of the technology that's being wheeled out across the Mercedes range as it attempts to reduce emissions. If you're more interested in cars you can buy now, there's something to suit every budget, from the A-Class through to the Maybach 67.